Amco moved onto the land in Vale Mills car park at the end of August to set up their site office and compound before erecting scaffolding around Bridge 17, the large steel girder bridge carrying the railway over the River Worth on Mytholmes Curve. Renewing the cement pointing of this large bridge is now in full sway. the ends of the waybeams Kango tamped. The opportunity was taken to do some trial boring in the waybeams themselves and, based on the results, we decided that there was no urgency to renew them. The poor look of their surface is only skin deep: the main bodies of the beams are sound. A similar job in the neighbourhood involved placing packing pieces under the waybeams on the inspection pit New Shed. This is a job that the Loco Dept has been wanting us to do for a few years but has always come up against the obstacle of locomotives up on blocks, or with ‘Not to be moved’ notices adorning their buffer beams, right over the very spot requiring attention. 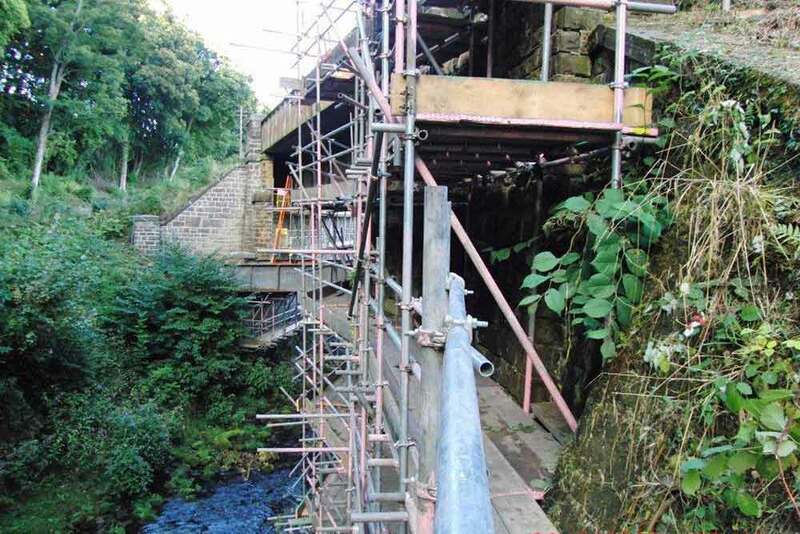 Thee Thursday Gang have prepared the site of a fairly large break in our drystone boundary wall between Haworth and Ebor Lane Bridge so that a competent person could give a walling demonstration – mending the gap at the same time, of course! Hopefully he spotted some budding talent amongst the gang!